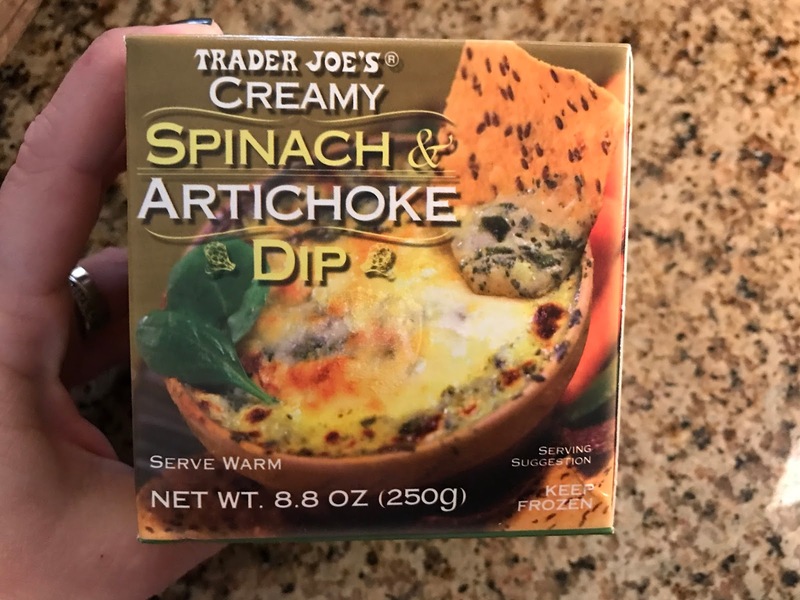 Last spring I blogged some of our favorite things from Trader Joe's and it was one of my most popular posts of the year. Trader Joe's is about 5 minutes from my house and right by the dance studio where Griffin goes and so it's easy for us to pop in and poke around. I know that lots of y'all don't live close to a Trader Joe's and are trying to figure out if it's worth the trip OR live close by but get overwhelmed when you go in so I thought I'd share some of our current favorites so you can add them to your list for your next trip. This is not ALL that our family eats. These are simply things that I purchase at Trader Joes and we typically don't have all of these on hand at the same time. I purchase the bulk of our groceries (produce, meat, dairy, etc.) at either Kroger or Market Street. I'm not a huge dessert person, but do like something sweet in the late afternoon and this dark chocolate sea salt caramel bar is a favorite to break a piece off of and get my "chocolate fix". The sliced French brioche is delicious and made the BEST French toast. It was seriously amazing. Dave also made a pretty killer grilled cheese with it as well. This chunky chocolate chip cookie dough is just as good unbaked as it is baked and we love that you can just break off what you need. TRUST me on these! We LOVE Trader Joe's Scandinavian Swimmers and I grabbed these gummy Xs and Os last week and they are SO GOOD!!! I put a few in the kids yum boxes yesterday and everyone loved them. 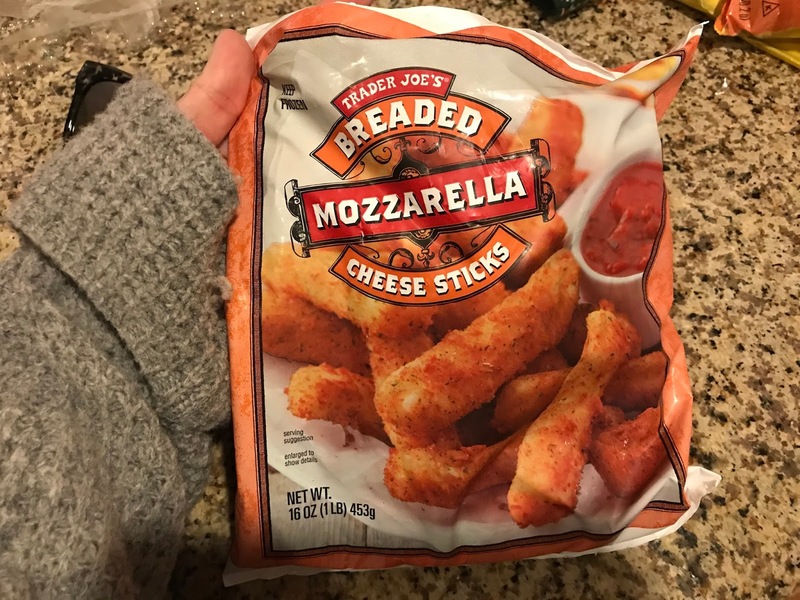 These garlic and cheese breadsticks make it into my cart more often than not but they're so good for dipping in soup! ... this creamy tomato soup is my favorite! 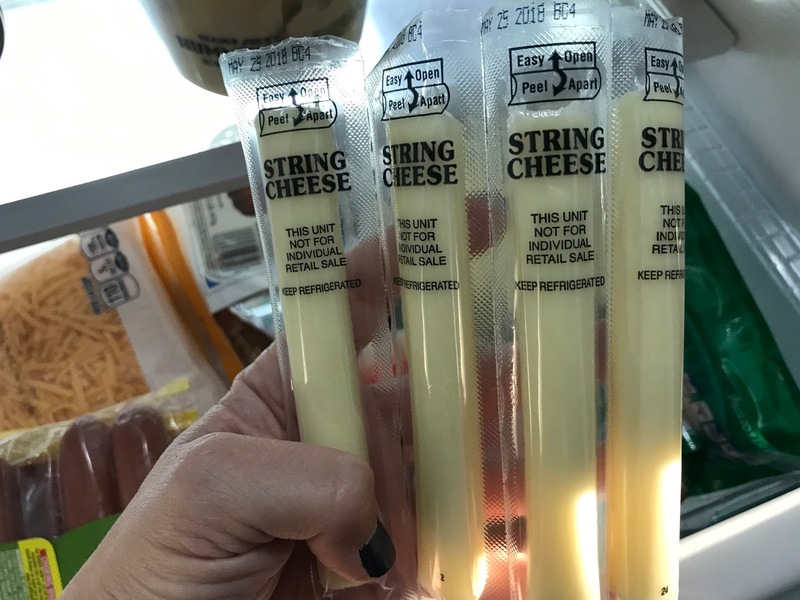 I love that I can open it, pour a mug, eat it with a grilled cheese (or breadstick!) and have the rest for another day. It's delicious! And while I don't buy all my produce at Trader Joe's their avocados can't be beat. These teeny tiny ones are awesome because most of the time you use the entire thing at a time and you don't have to try to cover and save it without it turning all gross. My bag of 6 was $3. ... and possibly the BEST TJ find of all time are the sweet potato frites. We spread them out on a cookie sheet, bake them at 425 for 20 minutes and they're crispy (but still soft in the middle) and SO SO SO GOOD! I throw some garlic salt and then sea salt on top, toss them all together and we all enjoy. ... and we all love having these in the fridge :) YES!!!! ... and their shredder parmesan is AWESOME! I LOVE guacamole and was skeptical about this one at first but it's JUST as good as regular guacamole and I don't have to feel so bad about my guac to chip ratio :) Plus it doesn't brown nearly as quick because of the greek yogurt. I picked the spinach and kale greek yogurt dip up on a whim and it's Dave's new favorite thing. I pick up a container every weekend and he loves it with pretzel chips. We've tried a lot of different hummuses and the Mediterranean is the BEST. I do have to scrap some of the top stuff off to the side for my kids, but it's so good! This is a sauce we pretty much always have on hand in the fridge for those nights where I don't have anything planned and need to throw together a pasta dish really quick or want something extra yummy to go over tortellini. ... and the cinnamon swirl bread (toasted and topped with a little bit of butter) is one of my breakfast must-haves. 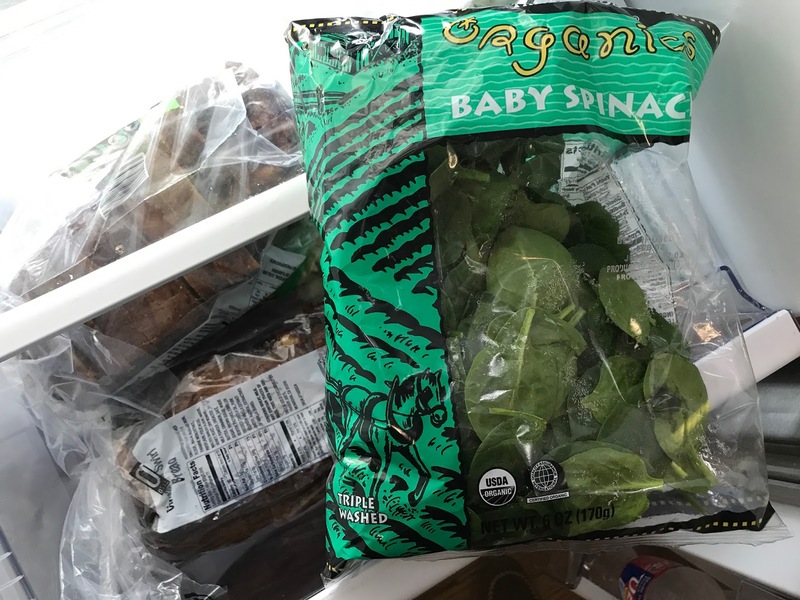 ... and their spinach is always a bargain. 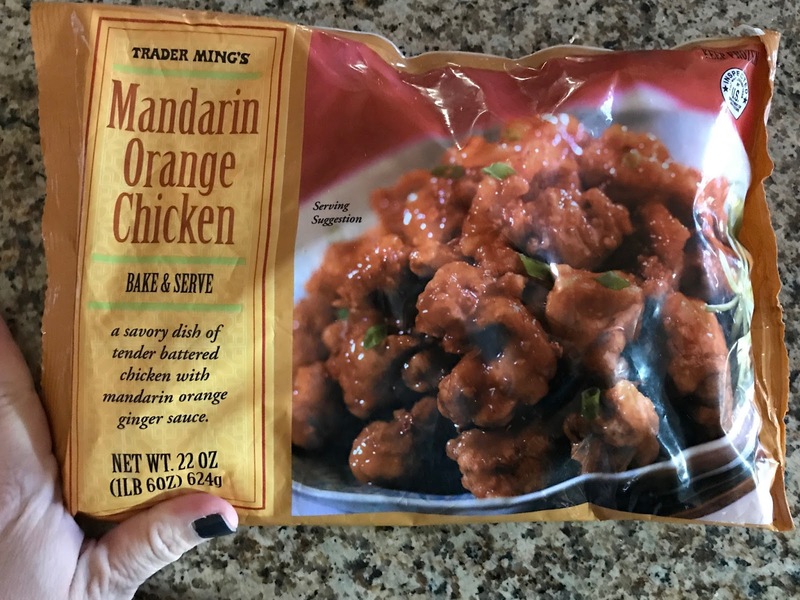 For an easy weeknight dinner we like to have their frozen chicken teriyaki, mandarin orange chicken and jasmine rice in the freezer. You make all of it in the microwave but it doesn't taste like it at all! All three of my kids will eat these and they couldn't be easier. These are another recent discovery and my kids ask for them almost every morning. We've only made them in the oven but I've heard that you can put them in the toaster as well! They bake up crispy and with a fried egg on top - PERFECT! Their Trek mix (the one with cherries and cranberries) is something we keep in the pantry and it makes a great school snack in a little baggy and is something that we all like to grab a handful of when we're on our way out the door. Their bread and baking mixes are all good but the pumpkin (and banana!) ones are the ones I like to keep in the pantry. My kids FAVORITE thing from TJ's are the party meatballs. 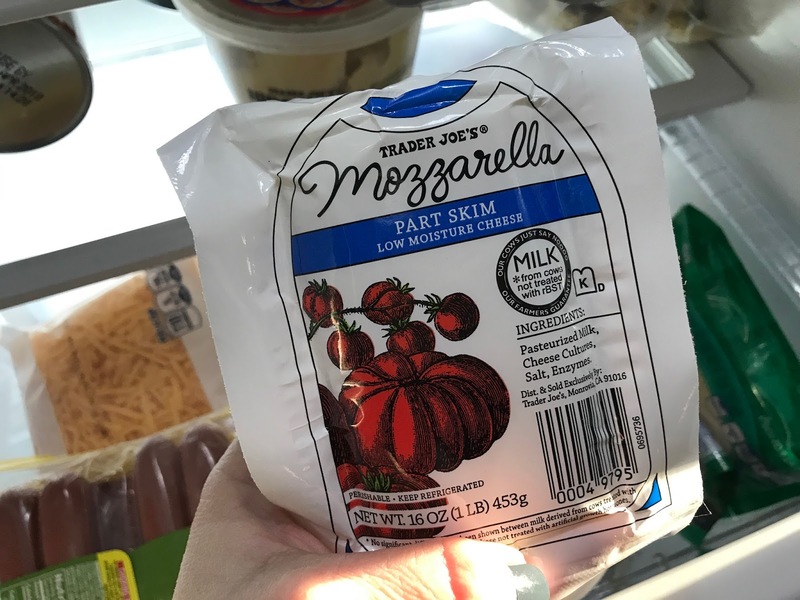 I'll put two bags of these along with a jar of marinara sauce in my dutch oven on the stove top until they're heated through and with a side or two we're good to go. It's seriously the easiest weeknight meal of all time. You could serve these over pasta (spaghetti and meatballs), on sub rolls (meatball subs) or just solo with some veggies on the side. 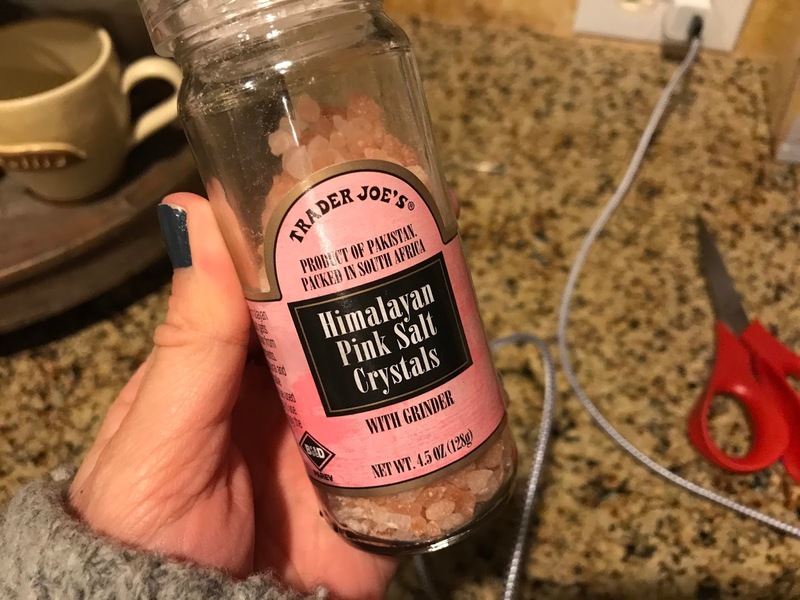 I've pretty much replaced all other salt with pink salt and it's good on EVERYTHING! 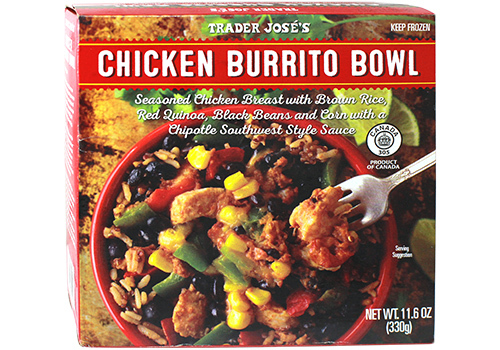 ... and the frozen chicken burrito bowls (which I forgot to take pictures of!) are a lunch staple for me. They're full of quinoa, peppers, chicken, cheese, black beans, etc. Seriously so good. I'll occasionally add a little bit of extra cheese and some diced avocado as well. I am officially addicted to these cinnamon apple snack sticks - they're kind of like those veggie straws - but seriously taste like apple pie. ... and I can always find a reason to grab a bag of flowers (and rarely spent more than $6). The ONLY thing that we've bought at Trader Joe's that I haven't been a big fan of is cookie butter. I was so excited to try it for myself and maybe I just don't know what to put it on, but didn't love it on graham crackers or bread. If you love cookie butter let me know how I should be eating it! So, there you go! 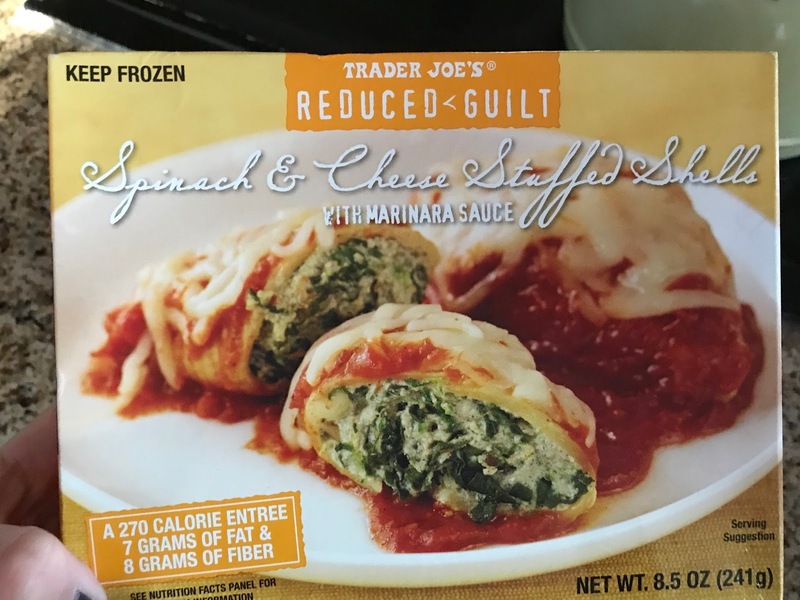 Current TJ's favorites! If you have a favorite that I need to try out leave it in the comments and if you want to see my post from last Spring you can check it out HERE. So glad you picked up those avocados!!! Life-CHANGING !! We love so many of your favorites! The cheese sticks, mozzarella sticks, and guacamole are must haves. We love their frozen green beans (the only green beans my kids will eat). I do the same with the party-sized meatballs, but also make Italian Wedding soup with them (just add chicken broth, TJ's frozen chopped spinach, and ditalini pasta - done!). The orange chicken is a family favorite. We always have it on hand. I use cookie butter as a replacement for peanut butter in baking (my daughter has a peanut allergy). At Christmas, I make cookie butter blossoms - http://mcculloughfive.blogspot.com/2013/12/cookie-butter-blossoms.html. I also make really good cookie butter chocolate chip cookies. I'm with you - I wouldn't eat it plain. Some other favorites of ours are their version of Rice Krispies, bagged lettuce/salads, fresh salsa, tortilla chips, fresh tortillas, and taco shells. I would have never thought of using it as a peanut butter replacement - that's awesome! Thanks for the tip! Your recommendation of the no guilt guac has made my life better. It's a bold statement, but it's true. You HAVE to get the Everything But The Bagel Seasoning too. It's awesome on pretty much everything. And their Puffs are delicious and a fraction of the price of Pirate's Booty! YES!!! Love both of those!!! Ha! It wasn't all in one trip - I've been saving pictures over the past few trips :) And how have I missed those?!?! Adding them to my list for the weekend! Next Saturday, I need to just shop with you :) . Video that for your blog! Pretzels!! You need to try dipping pretzels in cookie butter. So good - to the point that I can’t buy cookie butter anymore because my husband and I show zero self control. Cookie butter is delicious on a sliced apple! Cookie butter is so good on apple slices or just by the spoonful ;) I also replace it where peanut butter is needed in recipes. such a good idea! Thanks!!! How have I never tried their croissants?!?! Thanks for the tip! Sounds like a pretty good dinner to me! Cookie butter on a banana! Yummy! Really?!?! I'll have to give it a try! 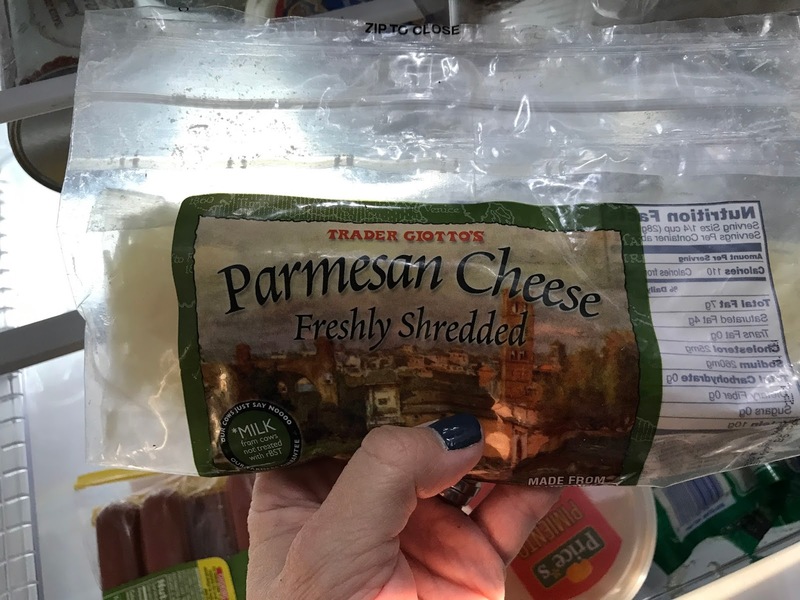 I LOVE feta so I added that to my next shopping list and we love the cheddar puffs! Cookie butter is good on bananas. I had found a recipe online that used cookie butter in cookies. It was good!!!! I am like you and didn't really get the hype. Then I made cookies with it and was hooked on those! I really enjoy the mexican corn from the frozen section. Delicious! Cooks in the microwave in 4 minutes. How have I missed the corn?!?! Adding that to my list for the weekend! It can be overwhelming at first so I totally get it! we go to TJ's about once a month (it's 45 min away) ... and a lot of your faves are always on my list. Sadly, we did not love the gummy x&o's, but that's the first miss we've had in a while. Chocolate croissants in the frozen section are also life changing. They smell SO good & look beautiful on a plate. They taste so, so good. Other must buys: fresh flowers, various cheeses (currently enjoying bacon cheddar), beer bread mix (when they have it), colombian coffee Kcups, salted caramel hot chocolate, butter, spray can whipped cream, puff pastry, MAC & CHEESE, applewood bacon, and the cowboy caviar salsa. Oh the croissants....those are amazing! I was so skeptical, but so good. I need to try those STAT! How did I forget the dough?!?! We LOVE their pizza dough (and sauce!) too - adding several of your suggestions to my list! in the interest of full disclosure, I've only had the chocolate croissants, I can't speak to any of the other flavors. they're so good (and pretty) that I I've wrapped them in cellophane for teacher treats. I’m pretty sure we have matching Trader Joe’s carts. So many good things! I think the X & O gummies are just the cutest. While I like the flavor of Cookie Butter- it's not my favorite to spread on things either. However- the Cookie Butter Sandwich Cookies are out of this world. Seriously- they are amazing!! And thanks for the tip about the Spinach and Kale dip- it is delicious. Also, the Vanilla JoJo Cookies are a fave, ten times better than a Golden Oreo! I don't think I've seen the cookie butter cookies before! But maybe I just glanced over them since I didn't like cookie butter?!?! Trying them out STAT! 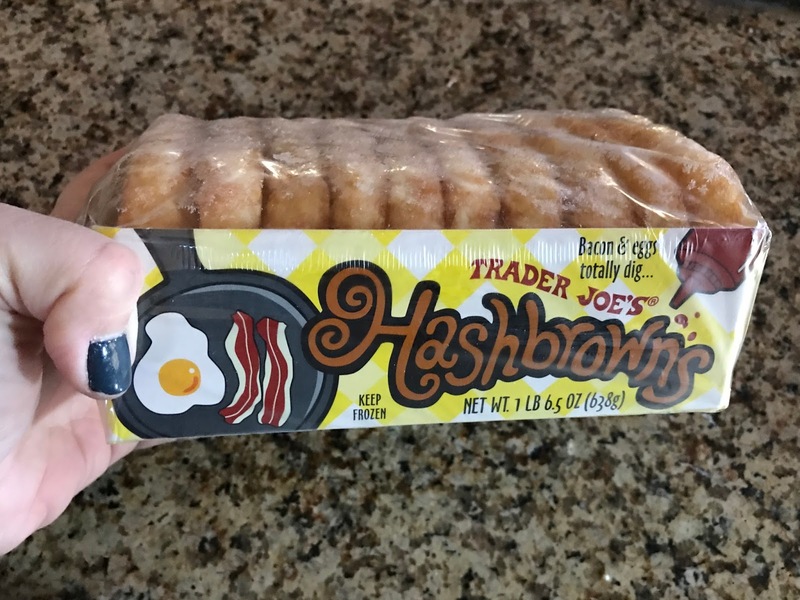 I need a trip to Trader Joe's! It's about 30 minutes from my house but I'm thinking I need to try these things. Thanks for sharing! :) I haven't tried their cookie butter but I LOVE Biscoff cookie spread. You don't need to eat it with anything other than a spoon! When you go let me know what you try out and love! We love TJs, but live over 3 hours from one. When we travel, we bring a cooler and stock up. The absolute best way to eat the Chicken Apple Sausage is with sweet potatoes & apples in a skillet. We eat this weekly at our house. Seriously THREE ingredients - no spices or seasonings even. It is fast and simple, plus the kids love it! These all look great! We don't live near a Trader Joe's. Do you know if you can order from them online? We love Trader Joes! Some of our favorites are the frozen mac and cheese, frozen microwavable brown rice, the frozen sweet and sour chicken (I add in a can of pineapple and chop up a green pepper), frozen chicken fried rice, frozen sweet corn, frozen pesto linguine with tomatoes, blueberry waffles, canned chicken noodle soup, the 6 packs of the 4 oz yogurt cups (the banana is so good! ), the chedder cheese sticks, the jojo cookies (their version of oreos). Love me some TJs!! I'm so glad you didn't like the cookie butter either - it was waaaay too sweet for me! I will for sure be referencing this! I picked up the rice and frozen chicken last time you talked about TJ's and we love it! That organic jasmine rice is THE BEST! I can't live without their frozen minced garlic cubes. The flavor is great and they're super easy to use! I can't live without their frozen crushed garlic cubes. The flavor is great and they're so easy to use! The dark chocolate covered pretzel thins are amazing! The purple bag. Also, the frozen mac and cheese is to die for. I’m not a huge cookie butter fan....but the cookie butter swirled with chocolate?! That is tasty!! Trader Joe's is about an hour from my house, but I am making another trip this weekend! Thanks for the tips! Love the spinach dip!! I love everything you mentioned above but I also love their beef and broccoli, their tea tree face wipes and the shaving cream. They are AMAZING!! You MUST try the Salsa Verde next time you go! We live in Amarillo, but seriously, every time we come to the metroplex to visit family, we buy a CASE of it. My husband LOVES it, and has seriously eaten 3 jars in one week before! And it less than 2 bucks a jar, so it's so crazy affordable. It isn't spicy at all, but has great flavors. My kids eat it with a spoon! Ha! 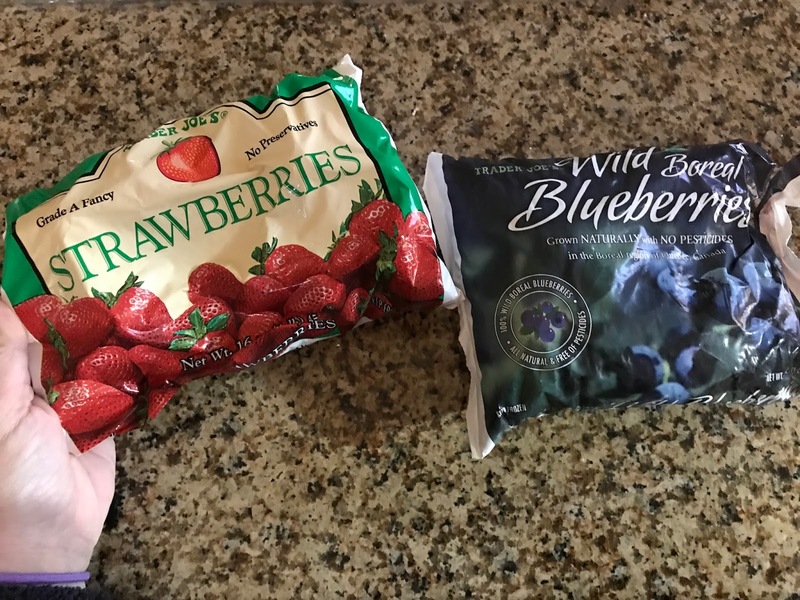 We also like their gluten-free chicken nuggets, and they have frozen fruit bars that are layers of raspberry, pineapple, and lemon (I think), that are delicious and such a yummy summer treat! I so wish we had a TJ's in Amarillo (or even Lubbock), b/c we would shop there all the time! I'm impressed by the cleanliness & organization of your fridge! Everything about this post makes me sooo happy! I recently have been shopping at TJ's and am looking to broaden my list of must haves! Can't wait to include some of your suggestions in my next shopping trip! After reading all the yumminess I had to go to Trade Joe's during my lunch hour. The Dark Chocolate Bar is amazing. But sadly my Trader Joe's doesn't sell the breadsticks. Thanks for sharing all your favorites! Their Guiltless Mac n Cheese is fabulous! I love it! just nice to heat that up with a side salad for lunch some days. I also love their Lavosh Flat bread for pizza's and their frozen fire roasted veggies for the flat bread pizza or the fish taco bowls I make. heat up and throw in. So good! We also use the Lite shredded mozzarella. Its so good! *Spicy Peanut Vinaigrette! Use on their broccoli slaw with green apple, walnuts and dried cranberries! serious compliments!